The modern breed of online shopper is like a picky eater. They know they want the lasagna but it better not have mushrooms or onions and you can forget about the peas on the side. Luckily we’re not all that picky when it comes to our pasta, but modern consumers do have high expectations for their eshops. Speedy deliveries and great customer service are a must, but what really makes the difference is unique offers and promotions that provide a personal touch and create true value for the customer. Customers browse, on average, 5-6 pages per site visit, and typically leave without making a purchase. With 10-50 thousand products in stock on the average site, it’s clear that most of what each shop offers is suffering some digital neglect. Providing personalized product recommendations is an effective way to bring your amazing inventory to your customers’ attention. Up to 30% of Amazon.com’s total site sales are generated just through product recommendations such as their “Customers who viewed this also viewed” block! 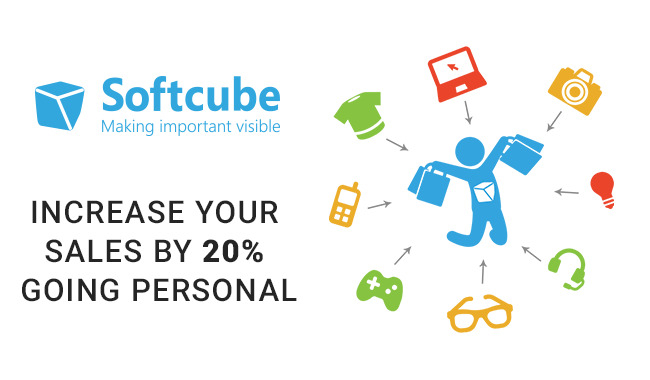 Softcube can increase sales by using powerful collaborative filtering technologies, not only powering recommendation widgets on your site, but also generating targeted emails and customer-specific promotions that are proven to drive sales and boost your bottom line. 1. Some ‘levels’ of data are easy to work with even for a traditional marketing specialist with no training in complex data analysis. Demographic and ‘standard’ customer account data falls under this category. Segmenting your shoppers by gender, location (using IP or mailing addresses), or even first letter of the last name is quite easy. 2. Product segmentation is another example of data that can easily be managed by a traditional marketing professional. Segmentation involves categorizing products into logical groupings, arranging them so that browsing through the eshop is both simple and efficient. It’s about calling a keyboard a keyboard, a mouse a mouse, and noting that they both fall under the category of computer peripherals. Useful, yes. Overly complex? No. Recency = how recently did they purchase a product? Frequency = how often do they purchase this product/ these products? Monetary Value = How much do they spend when they make a purchase? We can determine when to mail a promotional offer to whom and for what product(s) using an RFM analysis. If Henry bought a new Huawei phone 1 year ago, and he typically upgrades every 12-14 months (based on our records), then we would determine that it’s an optimal time to send him a promotion offering a free 16GB micro sd card with his next phone purchase. If Michelle only buys a new phone every 3 years, then this same analytical method would show us that it’s not very useful to send her a phone offer if she just made a purchase last year. 4. Displaying cross-category connections is another marketing tool that can be employed with the help of marketers and programmers, but does not require sophisticated data analysis. Showing mice alongside keyboards, or shoes next to socks are examples of cross-category connections. A logical display of merchandise can certainly increase sales, though it won’t set you apart from the competition. 5. Automated personalization services represent the most complex form of data analysis. Personalization means that your eshop looks different for each unique customer. Collaborative filtering of big data allows analysts to make inferences across huge datasets, discovering trends and marketing possibilities that would have been otherwise unknown. Providing personalization services in-house is quite expensive, and in most cases would make little financial sense for a small or medium-sized business. Softcube makes this expertise available to all, allowing eshops of any size to offer automated personalization services. Russell interprets big data concepts for the non-data scientists of the world. He holds a BA from Lehigh University in Pennsylvania, is currently studying at the Jagiellonian University in Kraków, and would like a dachshund.